Welcome to The Abso!ute Sound online! We explore music and the reproduction of music in the home. We believe that the sound of music, unamplified, occurring in a real space is a philosophic absolute against which we may judge the performance of devices designed to reproduce music. Our goal is to provide the resources consumers need to judge how a component's sound either honors or departs from the music's truth, and to make sound purchasing decisions that maximize their experience of reproduced sound. Below is our Issue 247, November 2014 table of contents and editorial. 12 From the Editor: Robert Harley looks at the radically changing landscape of today's audio products. 14 Neil Gader brings you highlights of the fifth annual California Audio Show. 18 Jeff Wilson offers a moving tribute to jazz great Charlie Haden. 22 Robert Harley visits Albert Von Schweikert's design laboratory to see firsthand his work-in-progress mega-speaker. 26 KEF, DALI, and Rega introduce new products at Audio/Vision San Francisco's event celebrating its new location. The folks behind NAD and PSB bring you a wireless multi-room audio system. Spencer Holbert reports. Steven Stone reports on a terrific and affordable DAC that does it all. Is there a higher-value loudspeaker than the new Magnepan 3.7i? Jacob Heilbrunn doesn't think so. Spencer Holbert on a lower-noise turntable mat. Spencer Holbert tells you how to join the personal audio revolution. Seventeen TAS contributors select ten "entry" recordings that offer ideal introductions to various kinds of music. 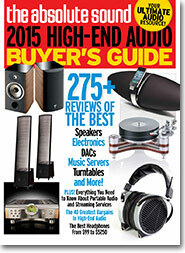 We pick the greatest values in high-end audio today.